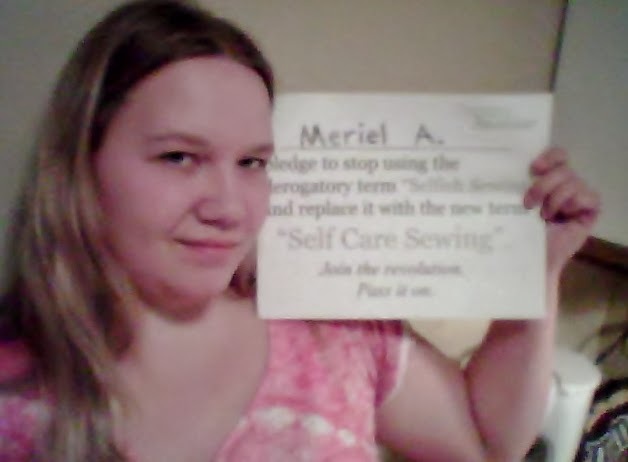 elli & nels *in stitches*: Putting an end to "selfishness"
Selfish Sewing. If you sew, you've probably heard the term (and even if you don't sew, you may know it). 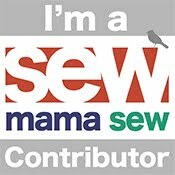 Selfish sewing = sewing for oneself...or does it? Staring at all my little log cabin blocks last month, after finishing the SewCanShe New Year Sewalong, I finally decided that they should be made into a big ol' tote bag. Perfect for diapers and baby/toddler paraphernalia, or library books, or even groceries. My toddler instantly claimed it as "hers", for about 15 minutes. Then it was my diaper bag for a couple of days - until I read Robin's post. This is for me. It now proudly holds all of my quilting pieces I'm working on, and my embroidery projects. Then I realized - that tote is MINE. It's not for diapers. It's not for kids' books, or for changes of their clothes. It's not for my husband to carry around his laptop in (okay, so he wouldn't be caught dead carrying it, but if he wanted to, he can't). It's mine, for my stuff, whatever I want. And that's okay. I have my selfish moments, for sure (I do NOT share my food, chocolate in particular). But I do give. I give my sanity and my energy (what little of both I have) to my kids, constantly. Which is fine. I give the same to my husband, and I don't begrudge him that (much ;) ). Minutes after finishing that bag, and admiring it (I've never made a bag before, and I wasn't using any sort of pattern at all) I was already thinking of a few people I could give it to. What's wrong with that? Well, nothing. Except...I worked hard on that bag. It came from me. The only part of it that belongs to anyone else was the tutorial for the log cabin blocks (which was awesome, and now I'm kind of addicted) - but the layout, the measurements, the construction: all me. And I love it! There are imperfections, sure, but I DID IT, and I'm proud of it! So why give it up? Because that's what I've conditioned myself to do. I've only been sewing for three years - but in that time, I have never once sewn anything for myself. At least, nothing that I've actually kept. There is always someone who wants it or needs it more, and I've given. I don't regret the past three years, or anything I've ever given away! Of course not! It wouldn't be any fun at all to sew if all I did was keep it for myself - part of sewing is community, and sharing with others. There is no better feeling than giving someone a gift that you have made yourself, and are proud of. But that feeling extends to giving yourself those handmade gifts, too. Or at least, it should. That isn't being selfish. That's why the term "selfish sewing" is so offensive. It implies that any time you sew anything, it had better be for someone else. It implies that should you make something for yourself, it had better be something you need. It asks "how dare you take that time spent sewing and use it on yourself?" Well, how about because I can? Because I want to? Because I need to, for myself? That time spent sewing is mine. It's my sanity-saver, some days. It's my passion. That post put into words a feeling I've had, but couldn't express. We should be allowed - no, encouraged - to sew for ourselves. As Robin said - it's self CARE sewing. It's not selfish at all. Self care sewing = sewing for oneself. Because you need to, because you want to. That's reason enough. Now, kindly excuse the miserable cell phone photo, and go sign your pledge here. And then go make something for yourself! Wear it, carry it, love it! It's yours - for you.